Office space seen going the way of dinosaurs for Fairfield Co.
NORWALK, Conn. – The lack of validity of putting office space on the highly visible piece of Norwalk property now owned by a mall developer is shown by the problems brewing in Norden Park, Ernie DesRochers said. While the Land Disposition Agreement (LDA) for the 95/7 site calls for 600,000 square feet of office space, many people say there isn’t much of a market in Fairfield County for it. DesRochers has concrete evidence – the departure of Northrop Grumman from Norden Place is likely to cause a $72.9 million loan to go into default, according to an article posted last week on Commercial Real Estate Direct. The loan, the third largest in the collateral pool for Credit Suisse Commercial Mortgage Trust, has been placed into special servicing, the article states. Barclays Capital projects that the loan is likely to default in the coming months, as Northrop had been leasing 52 percent of the building, and, if that 615,357-square-foot space is not leased, the cash flow for the property would fall to less than 30 percent below that needed to keep the Commercial Mortgage-Backed Securities (CMBS) loan current, the article states. General Growth Properties (GGP) is expected to ask the Norwalk Redevelopment Agency and the Common Council to change the 95/7 LDA to allow it to build a mall. DesRochers said in an email to NancyOnNorwalk that the Northrop departure offers evidence that the LDA needs to be changed. “Office space to the amount being discussed is a bad idea at 95/7,” he said. Michael McGuire of the Austin McGuire Company, who has more than 20 years’ experience in real estate, agrees that large corporations are not renting office buildings. Big buildings are “basically becoming obsolescent,” he said. Corporations don’t need to have their employees in one place anymore because of computers and the Internet, he said. They are typically shipping their operations south of the Mason Dixon line because of the much lower cost of living there, McGuire said. Buildings in certain locations, such as near a train station, are doing better, but office space in more suburban locations will not survive unless they are cut up, McGuire said. “The buildings that can be cut up have already done so. Those that haven’t been cut up because it’s just not feasible to do so have vacancy rates overall of 40 or 50 percent plus,” he said. “The office park is not going to come back as it was, at least I don’t see it in the future, unless the taxes rise so much in New York it drives businesses out. That would only be for a short run because I think the way businesses are evolving right now because they’re just going to low-cost states,” McGuire said. That’s why you see Texas Gov. Rick Perry visiting Connecticut, he said. Perry comes up to pilfer business in a form of corporate warfare, he said. The corporate warfare is local as well, as New York Gov. Andrew Cuomo offers tax-free zones and Gov. Dannel Malloy tries to swipe businesses from neighboring states, he said. There’s an approach that can help this area weather the storm of corporations moving south, he said. “We’re just not going to attract business around here. … But what we do have going for us is the highest density of educated people in the country is here, and access to capital. So what we should do is start businesses here and when they mature, ship them down south or to other parts of the country,” he said. That’s a cycle that would take place over 10 to 20 years, he said. “We’re a real incubator for starting businesses. That’s a positive, that’s why they say growth up here in the Northeast, or this area, is going to be small businesses,” McGuire said. When the 95/7 LDA was drafted for Fred F. French Investing LLC, it was all office space, McGuire said. No one in the ’80s could foresee that large office buildings would become obsolete, he said. When Spinnaker bought the land, the LDA was changed to make it mixed use, including the 600,000 square feet of office space. “You can’t build an office building unless you have it 50 percent pre-leased,” McGuire said, because you can’t get the funding. Spinnaker had AIG lined up as a lead tenant. AIG suffered a meltdown in the 2008 recession. The Catch 22 of the need to get a big tenant lined up for a new building is that eventually the tenant will exit, leaving a big hole in the cash flow, McGuire said. DesRochers said there is an additional reason that Norwalk should not put office space on the 95/7 property. Really, a shopping mall on Triangle Street? Maybe the worst idea in the history of Norwalk. Why don’t we just see if we can get the UN to move up to town. Spinnaker has repeatedly gotten into trouble over the years due to poor timing and business decisions, and the city for some reason feels they must come to the rescue. FYI, this is not news to the city of Norwalk. Redevelopment may have known about this for some time. When I attended the Tax Increase Resident Placation meeting last October in the Community Room at City Hall, there was a planning map which showed a “Shopping Mall” at Norden Place. I have said picture. I was told at the time that it was just an artists rendering. 95/7 could be a great location for high end residential apartments with some supporting retail, but that would require some easing of local zoning. Location is convenient for the turnpike and the RR station. Shuttle to the station, timed to match train schedule, could be a good way to commute by train without more cars parked at the station. On a clear day, upper floors would have views of the Sound all the way to Long Island. I haven’t heard anyone suggest office space be put in that location in a month of Sundays. If this is the strategy to whittle away at the LDA to say a Mall is a great idea for Norwalk citizens, this educated lot is not buying it. Good article, NON, and Ernie DesRochers makes an excellent point. A premier retail destination for 95/7 in the form of the proposed mall is smart, as it is part of what is already a large mixed-use downtown from SoNo to Wall Street. The factual evidence shows well-designed malls are NOT failing around the country as the local anti-mall Chicken Littles are declaring, and bricks and mortar retail is not dying but is changing with the times as it needs to. People love to shop in real places, always have, always will, and although some will sit in front of their computers or tap on their phones more than others to buy stuff, online retail will never replace the real need to touch stuff, try it on, and deal with real salespeople. It is also needed to put Norwalk on the map as a world-class city and a destination for new residents and businesses, keeping our tax base healthy and to stabilize and even decrease our crippling tax burden for the large middle class and lower income homeowners, including seniors, and hundreds of small businesses who are being squeezed. My only concern, and its a big one, is that Norwalk get a generous package of benefits from the state as this project will throw off an estimated $20-25 million in sales tax to the state every year. Over ten years, that is $250 million. We should get at least one year’s worth of incentives from the state, let’s say $25 million, to fund affordable housing, historic preservation, and transportation improvements including road maintenance, to help mitigate the loss of the once-vibrant historic residential neighborhood that once stood on the site, and to help us deal with the wear and tear from the extra traffic coming off 95 to get to the mall. When Stamford routinely gets hundreds of millions in state aid to lure companies and residents, Norwalk would not be asking for too much here at all. Are you listening, state delegation? The 95/7 site hasn’t been sitting idle for nothing. There’s a reason for why it hasn’t been developed; the downturn in the economy made the current LDA uneconomic in today’s environment. The LDA may have been a good idea back when it was made but things have changed. I can’t believe that the prior owner just wanted to sit and hold the property while paying lots of $$$$ in property taxes over the past 10+ years hoping to get his money back. That is just economically irrational. One would think that if other successful developers had great ideas for the site, they would have tried to purchase the site. Avalon Bay and BLT are building apartments all over Norwalk and Stamford. One would think if they thought the site would support an apartment complex that they would have purchased the site. But they didn’t. The only developer to date who sees potential in the 95/7 site is GGP. While some people may not like the idea or think there’s a better use for the site, no other developer has stepped forward. So the question is do we let the site sit empty for another 5 or 10 + years until some other developer comes along or do we go with the development plan by GGP to build a mall? Forecasting the future is difficult but office buildings are here to stay. Just ask business firms. With appropriate incentives office construction has a real future here. Beware real estate interests giving “advise”. Just clarifying my comments – I don’t contend that office is obsolete. I contend that “large floor plate office space” is obsolete. Businesses today are smaller, and the larger ones are generally scaling back in footprint in the our area(there are always exceptions). The “growth” in office space in our area will be in buildings that can efficiently accommodate 5,000 SF and smaller users. New office space should not be built (and will not be built) until the overhang of existing space is absorbed or demolished – a tall order given CT’s business climate and office vacancy rate. Mike Mushak, I just don’t get your support for a Mall that will include duplicated throughout the area stores and provide a limited life building cycle and/or put at least one of the four malls within a 25 mile radius out of business (the effect new Malls have to existing Malls particularly close by, supported by research on other threads.) In addition, there has been plenty of research to suggest that this particular Mall’s design is not only out-dated but being destroyed throughout the country. That, plus the steady increase in internet shopping (which you seem to dismiss rather readily), data which has been provided on other threads, and the low NASDAQ rating of a company that filed for bankruptcy in 2009 makes one pause as to why a Mall should be considered at all. I still think a cross use sports/culture center that would really be a standout for Norwalk, like the Aquarium, is a much better use for the site and more amenable to ALL Norwalkers and others from throughout the area, not just those who shop (or “need” a shopping center close by instead of driving the short distance to Stamford, Danbury or Westchester.) This Mall idea will not make Norwalk a destination. It will make it redundant. I have added a photo of the artists rendering mentioned by Wineshine, with a shopping mall specified for Norden Park. Facts are facts and those who demand office space instead of a mall have no clue how supply and demand work apparently. You guys don’t have the money to build your so desired office space so sit down and stop blabbering. Regarding the Norden site, the entire property was once industrial zoned. As part of a careful review of the zone, and the long term development issues, the zoning commission, modified the zone to allow residential and increase the commercial office uses in the zone. As part of the application process as the parcel was subdivided, a residential project was approved with a 7 acre permanent conservation easement, and the an office building was approved, that has turned into the largest data center in CT. There are world class marketing companies currently leasing, Red 7 and Circle Marketing, each representing the new broadband economy that so many who comment here seem to forget about when it comes to economic viability. A shopping mall, would not be anything that meets the master plan, nor fit into the neighborhood, nor be supported by zoning code and existing uses on the site. jlightfield is experienced in the matter and is correct. For anyone suggest that this setting is proper for a mall, is in no way short of lunacy. Does the thought, “well, we just have to do something” trump all intelligence? If you’re busy debating whether or not bricks and mortar is still viable, take a breath,that’s not the question here. For those of you who are not familiar with the area, I urge you to get in your car, and check out the neighborhood. Let’s get this straight, BJ’s is too large for the lot on Route 7, a busy state road, but a residential neighborhood, which is only accessible by two-laned city streets for a mile, at best, is a good fit for a mall? All that aside, anyone remember the wetlands issue that prevented Spinnaker from building the original 400+ unit development? There are no words to describe how insane this idea is. I realize that this is likely a long way off if it happens at all, but the message to the taxpayers of Norwalk will be, NO ONE IS SAFE FROM DEVELOPERS. And you thought a mosque would hurt your real estate values? Let’s keep out fingers crossed for a Foley-Somers victory next week. It’s clear CT is doing everything wrong to discourage businesses from remaining and relocating here. After nearly four years lackluster growth, it’s time for a change. “online retail will never replace the real need to touch stuff, try it on, and deal with real salespeople. It is also needed to put Norwalk on the map as a world-class city and a destination for new residents” Ha Ha. —the typical brick & mortar retailer today carries less than half of the items in its particular category that are available online, and charges much more than e-retailers charge even with shipping costs included. —the typical brick and mortar “real sales people” are generally overworked, uncomfortable, and not very helpful to shoppers. —Norwalk: Fabulous waterfront location–yes. Numerous amenities and conveniences–yep. Vibrant diversity and easy access to NYC, right-o. But “world-class” cities don’t have drunk-tank blocks like Washington St. where juiceheads from 40 miles around come to get sh-tfaced, beat each other up, and then maybe stray too close to the ghetto/project neighborhoods where they’ll be hit by bullet spray in front of the grocery store. Rusty, lol! Great sense of humor. Oh yes, retail is dead. How silly of me! No wonder you hide behind an alias. I would too if I said such things! Wineshine, the article was about 95/7, not about the Norden site. The Norden site was only used as an example of the failed office market by Ernie DesRoches who I agree with 100%, on this matter at least :-). You just misunderstood the very first line of the article. No biggy, you are forgiven. However, the zoning map you so cleverly recorded is fascinating. 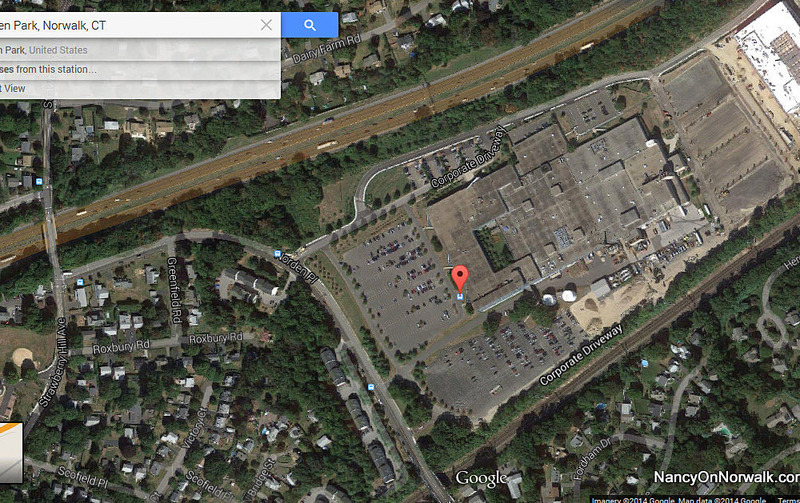 I never once saw or heard a mall proposed for the Norden site in my 6 years on zoning. It must be a joke, maybe the P and Z staff’s attempt at zoning humor? Maybe that’s how they get through the day working in City Hall! Jackie Lightfield then took the conversation into territory that was off a bit topic but necessary in her comment, and I agree she stewarded the Norden site when she was Zoning Chair into a new model of adaptive re-use of an obsolete industrial site, complete with ecological restoration of a huge permanent conservation easement with hiking trails, that is now open to the public as a free park basically for the neighbors who once screamed at us that we were destroying their neighborhood! . I was tickled along with her (easy for me to say, as my name wasn’t on the subpoena) that a few Norden neighbors decided she needed to be sued in an annoying bogus lawsuit for, get this, supporting a smart rezoning that saved the neighborhood from potential huge impacts of some future (perhaps phantom as well) manufacturing use that used to cripple the traffic in the area at every shift change when Norden was operating at full tilt, not to mention the air, water, and noise pollution of a huge factory in a purely residential setting. Sheesh, the nerve of some people who sue you for trying to help them! The low-impact residential use of Avalon was so quiet that one of the most vocal opponents in the neighborhood, who is prone to embarrassing public hyperventilating when he doesn’t get his way, wrote in the paper last March that once Avalon opens, all hell will break loose and the traffic will destroy the neighborhood. When I reminded him immediately that Norden was already 80% occupied even though their grand opening wasn’t until June, and he didnt even notice any difference in traffic, he literally foamed at the mouth and had my comment deleted by the frightened editors at our local paper! Only in Norwalk. The emergency data center Jackie referred to offers an essential service and generates increased property taxes, but I was disappointed it was not a bona fide office building with lots of high quality jobs. It basically has a skeleton crew of a dozen or so employees that can swell to hundreds after a hurricane or other disaster that is only temporary. But hey, we take what we can get sometimes. The other office development expected on that site is not happening, hence the point in the article relating to the loan default. No one ever thought a mall would go there as far as I can see or remember! This article is a good example of how lazy reading by some commenters can get you in trouble, or at least make you look a bit foolish. NON isn’t National Geographic, and so you cant just look at the pictures! lol. Thanks Mike. Always good to be forgiven, but I’ll resist the urge to go tongue-in-cheek. A picture says 1000 words. 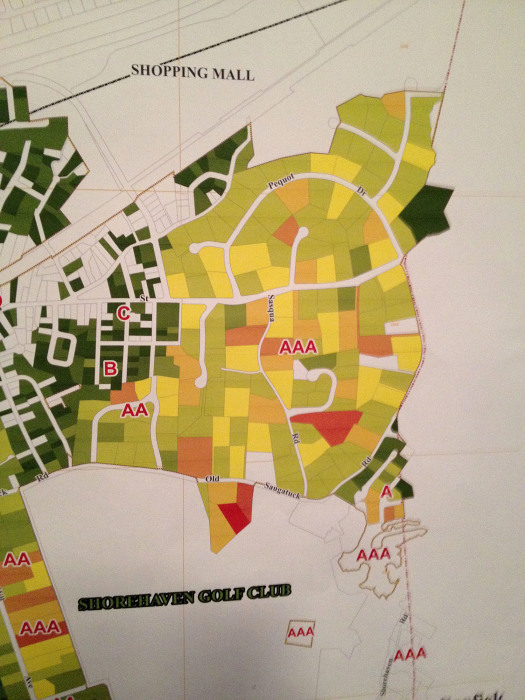 The map accurately shows the Shorehaven site, and zoning classes. Why would anyone assume that the Shopping Mall reference is a joke? Oh right, when some people want to deflect scrutiny, they write it off as boring, or a joke. “A premier retail destination for 95/7 in the form of the proposed mall is smart, as it is part of what is already a large mixed-use downtown from SoNo to Wall Street.” Mike, isn’t this you? Your reference to this topic, off topic re: the Norden site, mind you, led to “Mall” responses re: 95/7 that, thus far, haven’t been much of a joke. This article is completely confusing and, in that regard, I don’t suppose I am alone. Maybe Norwalk should have a minor league baseball team? Great venue for a stadium. Just a thought.